Posted on November 18, 2018 by Emily Allbon. This year’s winners of the ‘Exploring the Law’ blogs have been announced. Well done all! 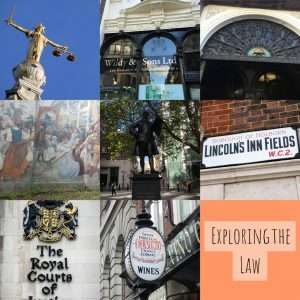 This exercise is undertaken by all first year undergraduates in their induction period; students trek across London finding specific locations with a legal twist. This is followed up by undertaking some research and are finally tasked with writing a lively and engaging blog on their travels. Each of those named will receive Amazon vouchers as prizes and will also see their work published over the Christmas period on Lawbore.